At the Wild Atlantic Way in the west of Ireland, when you pass Belmullet, Co. Mayo, to Blacksod Point, you come along the north end of Blacksod Bay. To the lefthand side of the road there is a stony beach. 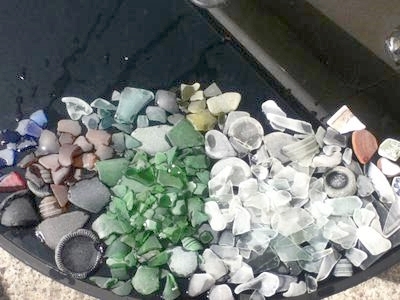 We were there just before the tide turned and were very lucky: our harvest of seaglass (and some seapottery) was brilliant. More than 1 and 1/2 kilo of the finest shards in all the colours you wish to find! !